Building your own aside, the QNAP TS-451 is a great starter NAS for homes with multiple devices. (-) Not so tasty: A little expensive, weird app design. Over the last several weeks, we’ve taken a good look at a couple of network attached storage (NAS) solutions including the beastly Synology Diskstation DS2515+ NAS and the smaller eight-bay QNAP TVS-871 NAS. Now we’re taking a hard look at the four-bay QNAP TurboNAS TS-451, which isn’t as large as the former two we reviewed, but still packs a punch in regard to features and performance. We’re not going to beat around the bush here: This QNAP NAS is simply awesome. The device is perfect for the home and could be used as a theater PC despite some of the hardware shortcomings. That’s because this NAS supports not only HDMI output to a monitor or HDTV, but you can plug a mouse and keyboard into the built-in USB ports for a full “desktop” experience. You can’t play games on the device, but you can certainly surf the web using Chrome or Firefox, both of which are apps that can be installed. Its squarish form factor measures 6.97(H) x 7.09(W) x 9.25(D) inches, and includes an Intel Celeron dual-core processor (2.41GHz, 2.58GHz Burst), 1GB of DDR3L RAM (expandable up to 8GB), 512MB of internal storage, four drive bays, two gigabit Ethernet ports, two USB 3.0 ports (one front, one rear), and two USB 2.0 ports (both on the rear). The USB ports can support a USB printer, pen drive, a USB UPS, and more. On the front of the NAS are LED indicators for Status, LAN, and the four hard drives. There are also an IR receiver, the power button, and a one-touch copy button. On the back are a single large fan keeping the innards cool, a password and network settings reset button, the power connector, and a Kensington security lock. So, despite the small form factor, there’s a lot going on in the TS-451. The TS-451 provides two interfaces powered by QNAP’s QTS operating system. There’s the back end, which is accessible through any web browser, and a front end that presents a number of services through the HDMI port. For the front end, there’s a link to the QTS platform that basically loads up the back end interface without having to access a browser. 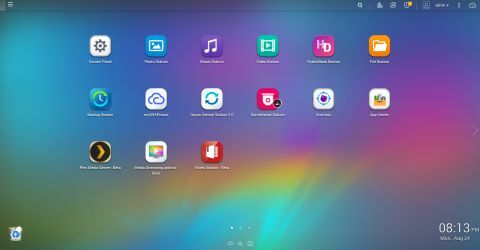 There are a number of apps that come preinstalled, including the Photo Station, the Music Station, the Video Station, the File Station, and more. Customers can get additional apps on QNAP’s built-in App Center, which plays host to a large number of apps that are compatible with this particular NAS. While the App Center is nowhere as large as Apple’s or Google Play's offerings, the QTS operating system provides three screens (or pages) for apps, just like a tablet or smartphone. Some of the installed apps should speak for themselves, such as the Music Station and Photo Station. The files we uploaded were through the File Station, to keep everything neat and organized via folders. By default, media files are crammed into the Multimedia file folder; other folders include Download, Public, Recordings, and Web. The QTS platform recognizes the file extensions and will provide access to these files accordingly, such as JPGs can be viewed in the Photo Station, MOV files can be played in the Video Station, and so on. The QTS back end also provides a neat and tidy Control Panel that's broken down into four sections: System settings, Privilege settings, Network services, and Applications. The System settings portion provides access to the general settings, storage manager, the network settings, notifications, and so on. The Privilege Settings provides access to user accounts, shared folders, domain security, and more. The Network settings within the Control Panel app provides a number of features including FTP, Telnet / SSH, SNMP and Service Discovery. Meanwhile, users can access the Applications section to manage the iTunes server, the DLNA Media Server, the SQL server, the Web server, Antivirus, and loads more. As we previously stated, there is a lot of bang for the buck with this NAS. One of the great aspects of the TS-451 is that you can access the stored files from anywhere, as long as myQNAPcloud is registered and activated. To connect to the device, users can simply open a browser and type “www.myqnapcloud.com/cloudlink/yournasname” where the “yournasname” is the name for the NAS taht you provided during setup. By having remote access, users can upload pictures and other files to the device on the fly, whether they’re on vacation or at the mall. For more savvy users, you can setup the TS-451 to a DynDNS service and configure your router to allow remote access that way. The TS-451 also provides QSync, an app that synchronizes files on a device with files stored on the NAS. There’s also the interesting Notes Station, which allows users to edit documents, spreadsheets, and slides that were created in Microsoft Office. There’s even the ability to stream media to a smartphone or tablet, a built-in antivirus service, and a surveillance station for customers with cameras installed in their home or office. The front end of the TS-451 is “controlled” by the HybridDesk Station. Here, users can install applications that will only be accessible through the front end, including Google Chrome, Firefox, Facebook, LibreOffice, Plex Home Theater, Skype, Spotify, TuneInRadio, and a few others. Also available on the front end are QNAP’s native applications, such as File Station, Music Station, Photo Station, and Video Station. Although we believe that the TS-451 is an awesome machine, the main QTS apps are a little weird to use. As we previously said, files were uploaded to the NAS via the Files Station app in order to keep all files organized whether they’re pictures or music. You can upload pictures into a specific folder and access them without much trouble, and you can also convert these folders into albums. Want to share them on a social network? Just right-click and choose either Picasa, Flickr, or Weibo. So, what's weird about the native QTS apps? Let’s take Photo Station as an example. The left-hand menu provides the following: Shared Photos, Folder, Private Collection, Qsync, Album, Smart Album, Shared Center, Recent, and Trash Can. Having both a folder and an album is a little confusing, which is why we took the File Station route. Albums can be shared with other NAS users and the “public,” which seems to mean only those that can access the login screen can see the album. Folders can also be converted into albums. For this review, we were provided with four Seagate (ST4000VN000-1H4168 SC46) hard drives with 3.64TB of usable space each, offering around 10.82 TB of overall storage. Users can keep track of each hard drive by going into the Control Panel app and clicking the Storage Manager icon. Here, you can receive data regarding each drive, cache acceleration, iSCSI, and Virtual Disk settings. There’s also a handy dashboard that you can access by clicking the speedometer icon in the top-right corner of the main screen. You can get a quick shot of the overall system health, various info about the hardware (system temp, fan RPM), the resource monitor, hard disk health, and the amount of storage that’s available. QNAP even pulls in its news feed, such as firmware and utility launches. According to QNAP, the TS-451 has a write speed of up to 82MB/s and a read speed of up to 126MB/s (AES-256 volume encryption throughput). These speeds were measured on a client machine consisting of Windows 8.1 Pro, an Intel Core i7-4790, and 16GB of DDR3 1,600Hz memory. We tested the RAID 5 write speeds using a rig with 8GB of RAM, an Intel Core i7-4790K clocked at 4GHz, Windows 10 Pro, and a 500GB Samsung 840 Pro SSD. We didn’t perform additional speed tests because the NAS and test rig are on a 1Gbit network. The result, according to robocopy, was write speeds of around 107MB/sec. Read was the same. The performance numbers highlights the ceiling for 1Gbit/sec Ethernet speeds, which by most accounts is more than enough for the purpose of the TS-451. All in all, QNAP’s TS-451 is a great solution for homes and small offices that need more than just a disk backup. The device works well as a home media server, a backup center, a tool for file sharing, and so on. QNAP also has a number of apps on Google Play and Apple’s App Store that expand the experience to phones and tablets. These include Qfile for managing files, Qmanager for controlling the NAS from a remote location, Qvideo for watching stored videos, Qmusic for streaming music, and so on. One thing that we wish QNAP had done was to make the native app usage a little more clear out of the box, as it may be a bit confusing for those who are just now buying into the need for a NAS (present company included). Even though the specs guarantee that Crysis will absolutely not run on this system, you could still use it as a small media PC for watching movies and TV shows and surfing the internet. There’s definitely a lot of bang for the buck here, enough so that there are still many aspects about the box that this review didn’t tap. The only real downside to this box of goodies is that it doesn’t come cheap: It's right around $450 without the installed hard drives. Still, there are a lot of services under the hood that we think make it worth the outlay.